The conflict between private ranchers and taxpayer-funded wildlife management agencies and endangered wildlife is coming to a head this weekend, and it may mean the heads of up to four wild wolves in eastern Washington. The state’s Dept. of Fish & Wildlife has given the green-light, totally under the radar (ie, secretly) and without public forum, to use helicopters to shoot and kill members of the Huckleberry wolf pack this weekend. They tried to do so today but were unsuccessful, and they head out to kill the wolves first thing in the morning. 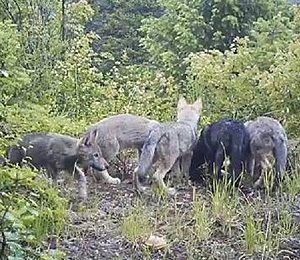 The Huckleberry pack, who have just produced a handful of wolf pups earlier this spring, will be annihilated this weekend if Governor Jay Inslee does not step in to halt the lethal attack. The secretive way in which the Department has issued this hunt — despite no public hearing held, as required by the terms of the wildlife management policies — raises serious issues regarding their ability to conduct proper wildlife management. Although the conflict represents the ongoing issues between ranchers who have claimed depredation of their sheep (without thorough proof that these sheep were killed by wolves; statistically it is known that many claimed wolf depredation kills turn out to be other native predators, problems with birth, or disease), but that in fairness even if the wolves have killed the sheep (ranchers are compensated), the state is required to fully exhaust all nonlethal predator control strategies. Here they have definitely not used all the nonlethal means available to them and have not at least tried to use other methods first, including range riders. These methods, though not wholly foolproof, have had some success. At minimum, these wolves and the hundreds of thousands of Washington residents who don’t want them killed, deserve a public forum first. Read the press release here by Amaroq Weiss of Center for Biological Diversity.